Despite setting the app to Eastern Time zone, it still shows some jobs as “due today” 5 hours at 8pm the day before they’re actually due! Not sure if this due to the time zone or if 8pm is a cut off? If the latter, why not move it to midnight? Also, it would be nice to undo an approved job. I was told this feature was coming, but 8 month on and nothing has moved. Is it that difficult to implement this rather simple feature? Otherwise, it’s the best app for allowances out there and $2 seems fair enough (not everyone mines information for profit to make it “free”). This app is a quick and easy way for my children to track their earnings and spending habit. It helps to teach them about saving, goals, and giving. We love it and have found many teaching opportunities. Highly recommend! I love this app for tracking my kids’ allowances and any other money they spend. I particularly like that I can set it to “pay” them every 2 weeks and a percentage goes into save and give. The goals that they can set up have helped them learn to save, and the spending notes have helped them realise that all those little purchases they make really add up and leave them with less money when they want something important. Overall, a great app. Super helpful for consistent tracking of allowance and teaching kids principle of depositing money to save. Allocating to specific categories with goals is terrific. 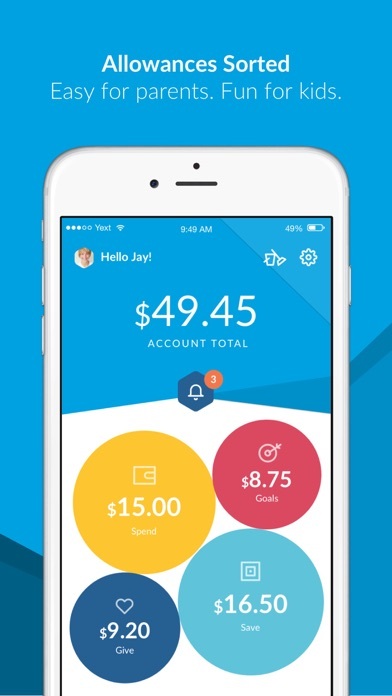 My kids love this app and i love that they are more interested in managing their allowance! This is a simple app - but for adding chores they are asking for $20 a year - compared to other apps this is robbery. It’s nice of them to have a free version so you don’t get robbed in advance. I pay my kids an allowance. And then I couldn’t remember how much they spent or how much I had given for extra chores this app helped all of that. Super easy to use. Very reinforcing for great follow up and behavior from my kids. 10 stars if I could. I was looking for a well-designed app that would allow me to keep track of my children’s allowances into three buckets, spend, save, give. It is so user-friendly and provides all of the features that I have been looking for! Absolutely love this app! I’ve tried several popular allowance and chore apps out there, but haven’t quite found exactly what I wanted until now! Rooster Money is perfect and so user friendly! I love this app!! Thus app is easy to use and I like that you can set a percentage of allowance - teaches kids you get paid for what you do. Also like you can take away some at a time - my child wanted something from store - cost her 1.50 of her rooster money - she got to choose to spend money and see her balance go down. My other child choose to save it. Good lessons learned. 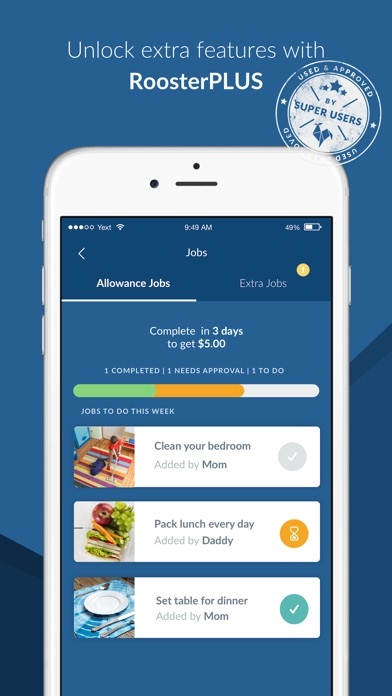 This app shows some promise, but doesn't understand how kids chores actually work. You can't create a chore, for example, to "put your laundry away today" -- you'd have to say "every Wednesday" or "once, with no due date." So -- it's not yet flexible enough for real life use. Still, the developers are semi-responsive, so maybe this will turn into something usable eventually. It would be great if when we boost money to our kids account it would automatically split it into our desired ratio of 80% spend, 10% save and 10% tithe. Instead you have to manually do that and enter 3 separate transactions with explanations. When making a withdrawal it would be nice if you could see what is in all 3 accounts while choosing the amount. We were previously using kidsbank and I was very disappointed when that app was shut down. We have 5 kids so you can imagine that managing their money and chores is not easy. We are liking this app so far but modifying the features I mentioned would make this fantastic! Also it is a little glitchy when adding chores manually. If google can’t come up with a picture and you try to go back and edit, it wants to make you put in a deadline date instead of leaving it open ended so you have to delete the chore and re-enter it with a different name so that google can find a picture. For example, I entered straighten craft area and Game Center and all I could get was pictures of hair straighteners. I look forward to providing further feedback as we begin to use the app. Though I do not use this for allowances it seems to be great. 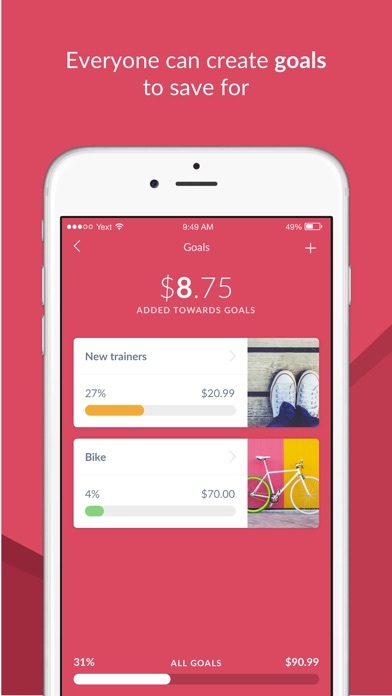 I wanted an app where I could track savings without it actually taking money out of my account. It has a bar and percentage so I can visualize just how far I have to go. I can create goals, which is exactly what I wanted, and I can add to the give section so I know exactly how much to tithe each week! I can break down my paycheck each week instead of just putting it in my account. So far it’s great. I haven’t had it long so hopefully it keeps working good. Though I’m using it for something different than its original design, I’m really liking it! This has made allowance so much easier. So practical. Everyone loves this app. And it makes chores and allowance so easy! I want to give a better review, but I want time to really explain why this app is so awesome. Thanks Roaster Money! I love how it engages my children, and the entire family. And it’s not always about the $$. We use the star/point system, we call them Truempernickles (the e is silent). We are able to teach budgeting while keeping it flexible for kids of different ages. A+, now just include a debit card option. Then we don’t have to use two apps! Dealing with allowance and kids’ money has been a challenge for us, but this has been an easy, low maintenance tool. My kids are 9 & 11 and this is the perfect free tool. The only paid piece I might consider is interest, but other than that the free version does everything we need. As I’m assigning chores to my kids I’m trying to alter days of the week for certain chores so one unloading the dishwasher on the same day the other is loading or having different laundry days so there’s no fighting over the machines. However, there’s no complete chore summary dashboard where I can easily view everything that’s been assigned thus far to each kid. I’m having to toggle back and forth through multiple screens to see what I’ve assigned. It’s making set up take longer than it should. This is with the Plus version. Again, this is only a set up gripe. Haven’t begun using this with the kids yet. All other set up features are simple and pretty straightforward. Great App solves so many problems in our household. I gave it 4 stars because I only have the free version, so there are lots of features that I haven’t used. I like everything I’ve used so far and think it’s worth trying. I love this app. There’s no more running to the bank to pay for chores or withdrawing. The memos are proof of payment- absolutely necessary for that fifteen year old who questions whether he got paid and forgets what he bought. Perfect app to create a personal family bank. This is an easy way for me to track my kids earned allowance without having to keep cash on hand all of the time. They like that they can see their “banks” when they want. Keeps track of kids allowance and spending , 3 of us share it. Love! 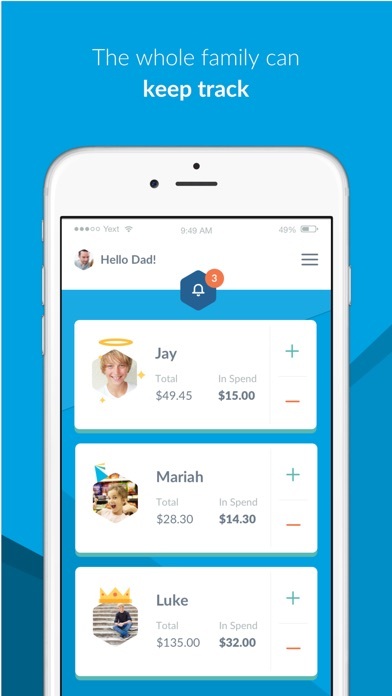 An excellent way for the tech savvy family to hold everyone accountable for chores and allowance intake and to encourage excellent money management! Streamlined and improving on a regular basis! A great support team and awesome financial goal availability. This is a great way to encourage independence in your child to keep track of chores and allowance. It is very user friendly and easy to set up and manage. It works great with my high schoolers and middle schooler. I love it!! 5 stars! Absolutely love the free version and it is well worth the small payment for the enhanced features on the subscription. I started a search for an easy way to keep a virtual piggy bank for my daughter but ended up finding a great finance app. RM teaches her about charitable giving (with automated donation feature), general saving (with interest! ), odd jobs around the house for extra cash, and saving for goals. Highly recommend RoosterMoney. This app has helped our family keep track of allowance and spending so much better that our traditional allowance method. The kids have the app on their iPods so they can see what chores need to be done each day and how much money they have to spend. Rooster Money is intuitive and has everything we need to keep track of spending, saving, and giving. This app has been great for allowing me and the wife to manage the kids money balances. Highly recommended if you’re needing something to keep track of your kids money in and money out. We have just started using this app with our family and we love the look of it. However, already we have found that we wish it had some features that we need: the ability for siblings to give/transfer money from one account to the other (sibling boost); and the ability to automatically save a predetermined percentage of any deposit; the ability to simply delete a transaction added in error, rather than removing a boost. This app was exactly what we were looking for. We are trying to teach our kids how to manage money and that “mom and dad are not made of it”. Our kids are 11 and after three weeks of using Rooster we have overcome arguments in the store about things they want because if they don’t have the money, they can’t afford it! We are also learning about giving and saving. Roster is a good tool for parents and very easy for both parents and kids to interact with. I love this app. We just started doing allowance as I never had cash on me for my 4 kids. Now they get their allowance, are charged money to use the computer and when we go to the store, I just subtract out their money from their account. It also lets you set an automatic dispersal of funds into giving, saving and spending! We live this app! I’ve been using it for the kids and we all love it. It makes it easer to keep track of their money and they are learning how to spend it and how to save! I never have cash so Rooster Money allows us to track allowance and not constantly issue IOUs. The interface is great and simple for my children to understand what they are earning and saving and helps them plan for purchases. Love it! This is the best chore and allowance app I have found. My kids are taking responsibility not only for doing their chores but for checking them off on the app as well. I love helping them manage their money in different pots and when we go to the store there is no more “I left my money at home”. I always know Exactly how much they have in their Rooster bank and I can easily subtract money when they want to buy something. This app is amazing. Very easy to keep track of how much money the kids have, and to put money into it when they do an extra job. Helpful to keep track of special toys they are saving up for, and setting aside money for charitable giving. Not all chores are done for money. I’d like a way to log minutes/hours earned for extra screen time. So far... I love it! I love this app... so far!! My 10 and 12 year old do also! Finally, something we can stick to and everyone is accountable! I’m amazed at how things are actually getting done! We are also a split family so this works SOO well with both parents on board in each of our houses!! You asked for suggestions... (Thru the app and I lost the area for suggestions ... so I’ll do it here.) - perhaps age related chores to choose from as opposed to just chores - (more extensive/creative pre-list) - kids can create a chore on their device and ask a parent if can be added to their list (gets them involved!) - educate the KIDS on saving, interest etc. - fun short videos they can LEARN from - show examples of interest and how it works - multiple goals? (Maybe thats already an option I forgot ... and I’m only a week into it) ... if they want to save for multiple items - kids might get a kick out of sounds for different actions - I agree on just a one time fee!!!!!! .... I probably could go on - only cause I love this idea and want to improve on the great app you already have going. I decided I would give this a two week trial (I’m a PLUS customer) and if I’m still as happy as I am ... I will be blasting this out to all my friends, acquaintances and FB groups (which may include a “few” Mom groups)! We have been looking for a way to keep track of our kiddos’ spending money in a more on-the-go, fun, user-friendly way. 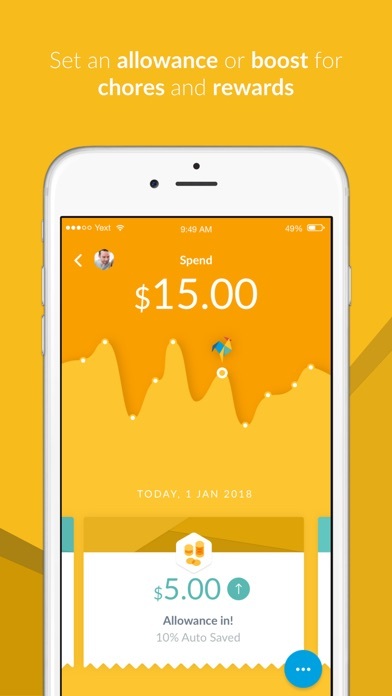 We recently found the RoosterMoney app. It’s all about managing pocket money with kids and teaching them about the value of money. When we set it up, we had them bring us the amount of cash that he wanted to deposit in their RoosterMoney “bank”. We can both have access to the same account so he can deposit and withdraw money from his phone and I can from mine. We can make notes for each transaction and we can also deposit/withdraw the same amount from multiple kids at the same time. When adding their “weekly commission” we can also sort it by “give”, “save”, and “spend” so we are teaching budgeting principles. It’s fun for them to see their money going up (or down) and helping them track how much money they have to work with in each of those 3 categories. It’s also free to join with the option of upgrades to add chores and several other features. We are loving it so far! Easy way of tracking and managing allowances! I’d totally recommend this to my friends with kids. I had been looking for a digital way to manage chore money for my daughters who are 8 and 9. This app is great. It’s intuitive, flexible and works well. I like the app overall, but it really needs to allow the kids money to go into the negative. I need to be able to know when they go negative so that they can do chores to zero out. This teaches them the pain of going into debt and allows me to remember when they do so. This is just what I needed to track my kids allowance. So happy to find this app! I have 4 kids and keeping up with their money is a challenge. They never have their money with them when they see something they want to buy, nor do I want them walking around with a $100 they got from grandma for their birthday. With this I can keep their money in my bank account and use this app to keep track of their balance. So glad I discovered this useful app!